Tópicos: Oshkosh, Appleton, Fond Du Lac, Madison, Bill, e Greg. 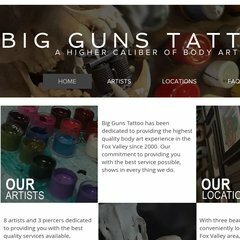 biggunstattoo.net Big Guns Tattoo in Oshkosh, Appleton, and Beaver Dam, WI - Tattoos ..
biggunstattoo.net Big Guns Tattoo in Oshkosh, Appleton, and Fond Du Lac, WI ..
Está hospedado em Brinkster Communications Corporation (Arizona, Phoenix,) utilizando um servidor Microsoft-IIS/6. Há 2 Nameservers: ns1.brinkster.com, e ns2.brinkster.com. A linguagem de programação utilizada é ASP.NET. PING www. (65.182.101.228) 56(84) bytes of data.